Beautiful visual graphics are essential for a good website. Images play a very important role in attracting new readers, so having beautiful photo galleries on your website is a must especially if you have a portfolio website! 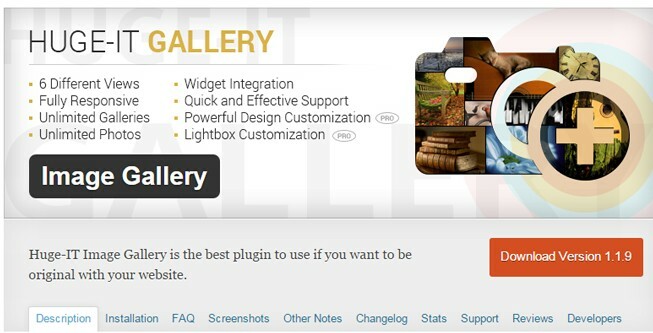 Today we selected 20 best free gallery plugins for WordPress. These awesome plugins are not only free but also have lots of useful features you can use to create gorgeous galleries. 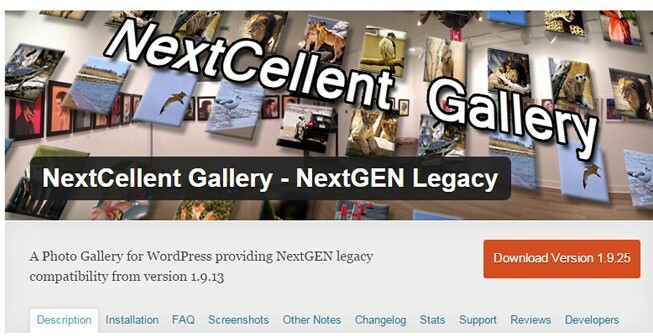 NextGEN Gallery is the most popular WordPress gallery plugin. It provides a powerful engine for uploading and managing galleries of images, with the ability to batch upload, import meta data, add/delete/rearrange/sort images, edit thumbnails, group galleries into albums, and more. 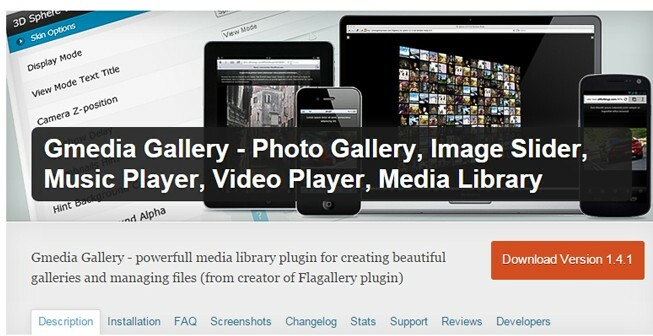 Grand Flagallery is a powerful media and image gallery plugin. It has an easy interface for handling photos, image galleries, audio and video galleries. 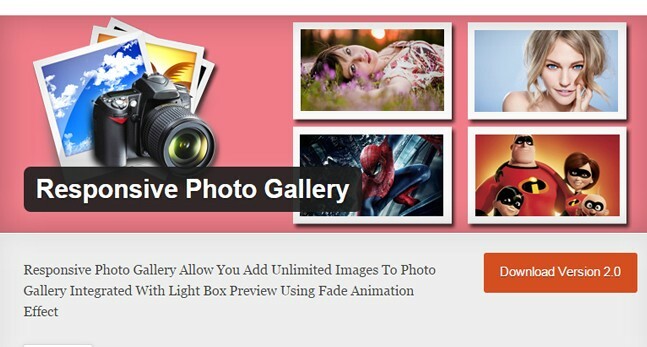 With this gallery plugin you can easy upload images, create music and video playlists, create photo galleries and more. Portfolio Gallery is perfect for using for creating various portfolios or gallery within various views. The product allows adding descriptions and titles for each portfolio gallery. It is rather useful whenever using with various pages and posts, as well as within custom location. Easy Media Gallery is a free gallery plugin for WordPress designed to display various media such as grid gallery, photo albums, multiple photo albums, photo gallery with pagination, image slider, image carousel, portfolio, and more! This WordPress gallery plugin offers diverse and powerful functionality for getting images from your desktop to your website. You can easily upload batches of images via a standard WordPress-style uploader, or upload images via zip file or FTP. 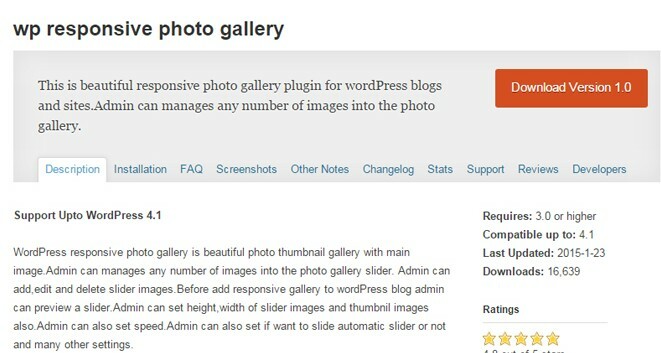 This plugin makes it possible to implement as many galleries as you want into your website. You can add multiple pictures and description for each gallery, show them all at one page, view each one separately. 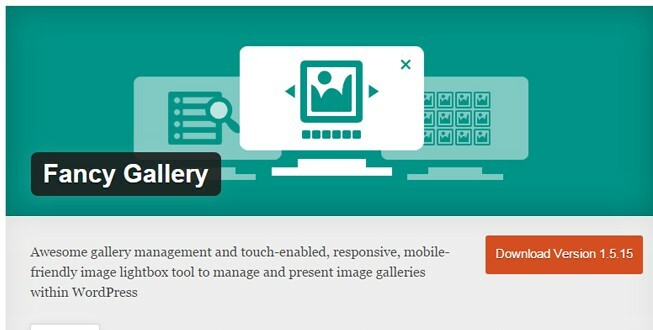 Manage files, show image galleries and photo slideshows, play music on your site with the Gmedia Gallery plugin. Gmedia Library provides a comprehensive interface for handling galleries, image and audio files. WordPress responsive photo gallery is beautiful photo thumbnail gallery with main image.Admin can manages any number of images into the photo gallery slider. The plugin displays a gallery on Google Maps with geotagged photos that has been uploaded to post. When clicked the photo on the gallery, zoom in image with lightbox. 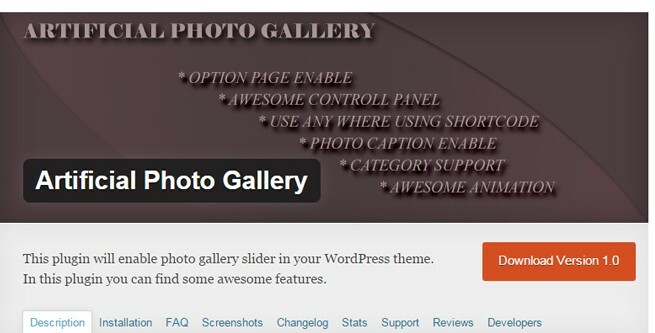 This plugin will enable photo gallery slider in your WordPress theme. In this plugin you can find some awesome features and you can control it from the options page. This plugin that allows you to show your Flickr photo stream, photo sets, galleries, group pools, or tags in your blog, with a very elegant and awesome layout. 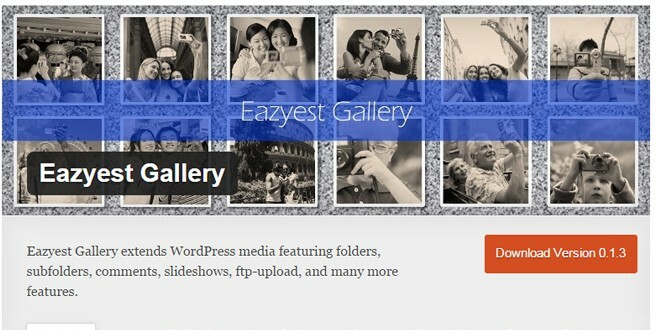 Eazyest Gallery extends WordPress media featuring folders, sub-folders, comments, slideshows, ftp-upload, and many more features. 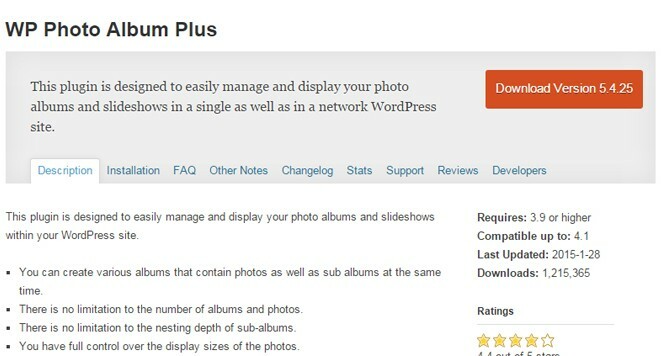 The plugin stores your all your folder information in the WordPress database as custom post types. 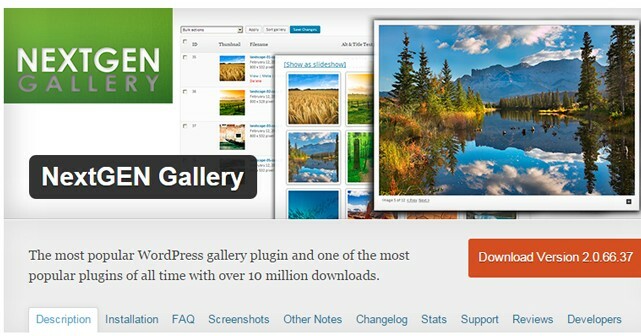 Enhance your WordPress website with the OmniGallery Photo Gallery. 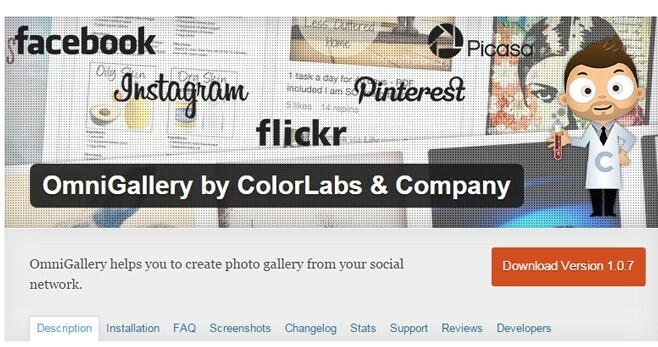 You can easily add your photo from Instagram, Pinterest, Picasa, Flickr, Facebook, and Dribble into your WordPress Gallery. Image Gallery was specially made to allow its users to create a lot of ways to showcase images, videos and information. Just add image or video descriptions and titles for each view of the Image Gallery and choose one of the 6 layouts. 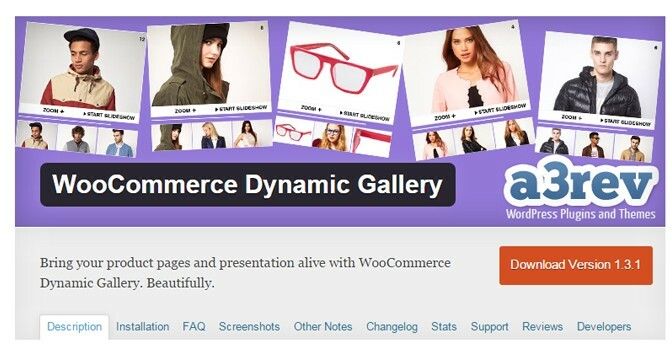 WooCommerce Dynamic Gallery brings your store to life with a beautifully stylish sliding image gallery on every product page. Responsive Photo Gallery is based on the Bootstrap framework. You can add unlimited images on your website. It has fade animation, light box image preview and two gallery layouts with various fonts. Gallery Bank is a WordPress plugin designed to create beautiful photo gallery albums with images and videos using: Grid Albums, List Albums, Individual Albums, Masonry Layouts and Thumbnail Layouts. I believe you’re missing the best one, Envira! Not a fan of NextGEN. It started to mess up my blog just after installation. Post went blank and couldn’t uninstall the plugin properly. The plugins are free or premium, This is no fact. The fact is that how much these plugins are effective for the purposes. In this case the plugins shared here are very much effective and tonic. 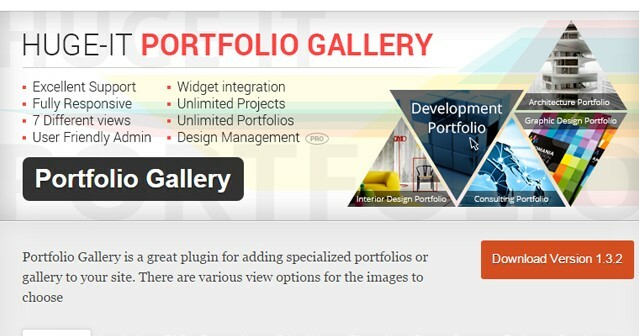 Thank you author for sharing such nice post on the best free gallery plugins for WordPress. Mainly this is very much effective and conducive for making a gallery on website. I would like to share here gsamdani.com/,one of the best plugins sources also. Thanks for the interesting review. I have tried some different gallery plugins, and stopped on Gmedia Gallery so far. It’s updated to version 1.7.4, great plugin for image/photo/video galleries. Thanks for the list, but I’m looking for a Gallery Plugin that does what Gallery3 did. Display a list of images in a grid form where each image links to a post., not open a lightbox. If anyone knows of a plugin that has that function I’d love to hear about it.